Homepage / Dog / Is Turmeric Safe for Dogs? The saffron or turmeric is a plant native to India with a root very similar to ginger in its shape and smell, but with a much more intense orange color. Although all its parts are used for therapeutic and culinary purposes, the most used is precisely its root in the form of powder. It is increasingly common to find this seasoning in our culinary recipes and natural treatments, however, did you know that it can also be beneficial to our pet? In this article of myfriendlypets, we talked about their most common properties and uses and answered the question ” Can a dog eat turmeric? “. Keep reading and find out all the information about this condiment in the dog’s diet! Now that we know that dogs can eat Turmeric and the amount of each of their components, we will review their most remarkable properties, both to treat and to prevent health problems in dogs. Turmeric is considered one of the most effective carminative plants, therefore, has potent digestive properties that favor the dog’s intestinal transit, stimulate the production of gastric juice and help relieve stomach problems. Likewise, it benefits the gallbladder by promoting the biliary flow and acts as a liver protector. If this were not enough, the digestive properties of Turmeric do not end here, as this spice increases the production of probiotics, a fact that results in an improvement of the intestinal flora of the dog. Although still investigated on the anticancer properties of Turmeric, studies such as the one conducted by the American Association for Cancer Research, Pharmacodynamic and Pharmacokinetic Study of Oral Curcuma Extract in Patients with Colorectal Screening or another study conducted by the Amala Cancer Research Center, Potential anticancer activity of turmeric , it has been observed that this plant may improve the clinical state of patients with certain cancers. However, as we have mentioned, the results are not yet considered conclusive and it is not possible to confirm precisely that turmeric prevents or treats the development of cancer, only that it improves the patient’s condition. The numerous studies conducted to date have determined that Turmeric efficacy is increased in patients with colon and stomach cancer, however, they have also found positive results in patients with lung, pancreatic and liver cancer, among others. These anticancer properties are also reflected in dogs, therefore, may help reduce the chances of developing tumors or alleviate cancer symptoms in dogs. The richness of minerals and vitamins of Turmeric makes it a powerful antioxidant. 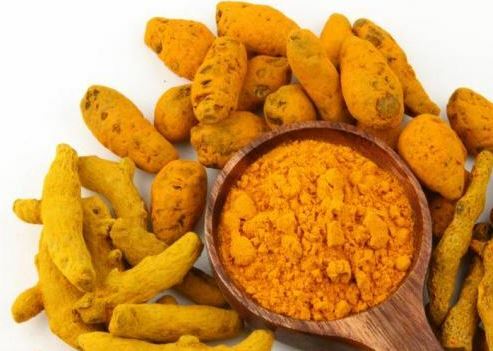 Especially if we feed the dog only on ration basis, the lack of these substances so beneficial to health should be covered with the intake of vitamin supplements such as Turmeric. Thus, the plant can detoxify the dog’s body and prevent cell oxidation. Thanks to the anti-inflammatory properties of Turmeric, this spice is increasingly used in the production of natural nutritional supplements used in the treatment of joint problems in dogs, horses, and other animals. Thus, by direct ingestion of the powdered root, it is also possible to alleviate the symptoms of various diseases related to joints and to promote the prevention thereof. In addition to all previous properties, Turmeric may also promote the function of the pancreas, the organ that produces insulin. In this way, this seasoning helps to balance the levels of insulin, triglycerides and blood sugar, in addition to strengthening the dog’s immune system. Depending on the use we want to give to saffron, the recommended amount may vary. So if we intend to use this plant to prevent the development of the ailments and health problems mentioned above, we can use it as a condiment using in the recipes at home, never exceeding 60 mg per day. If the dog does not follow a home-cooked diet, it is not recommended to sprinkle turmeric on the ready-to-eat ration. On the other hand, if we are interested in giving saffron to a dog to treat stomach problems, we can offer 2 to 3 grams per day, always with the approval of the veterinarian and within the time set by the specialist. For joint problems, the recommended daily allowance for dogs is 1 gram maximum. All indicated quantities are intended for dogs of large breeds (25-35 kg) and should, therefore, be adapted to the size of the animal. Previous post Can You Give a Cat Benadryl? Is Benadryl Safe for Dogs?